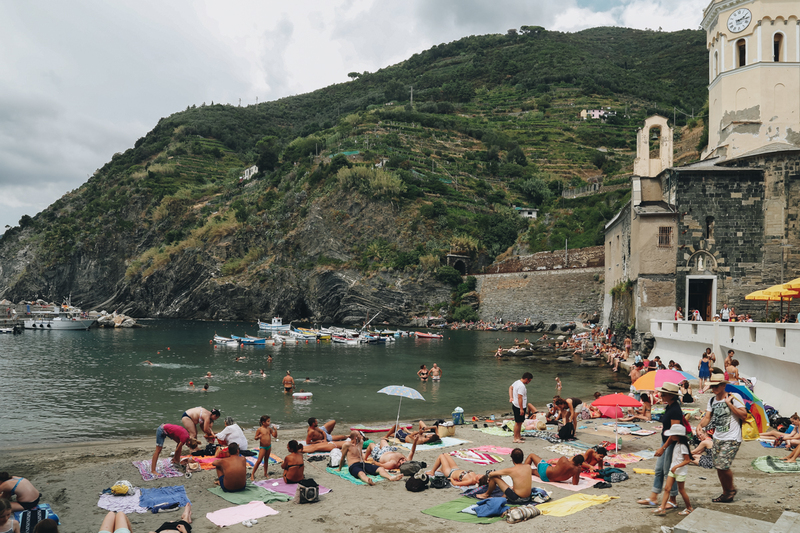 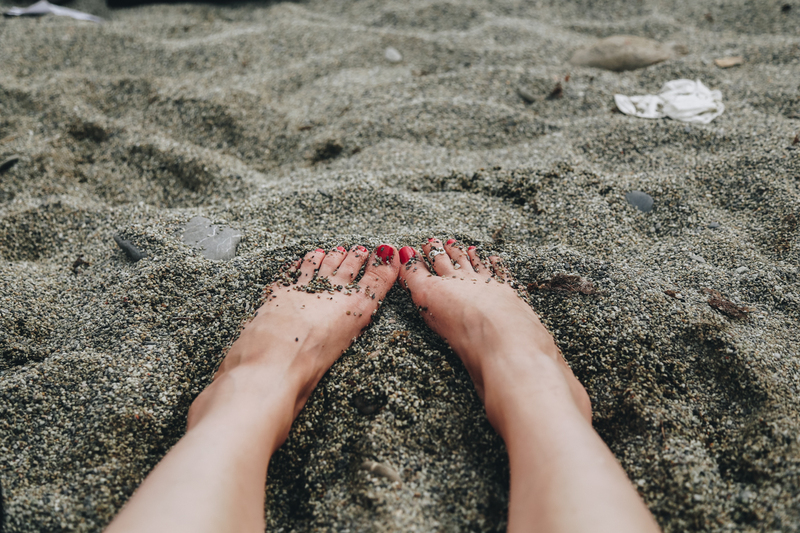 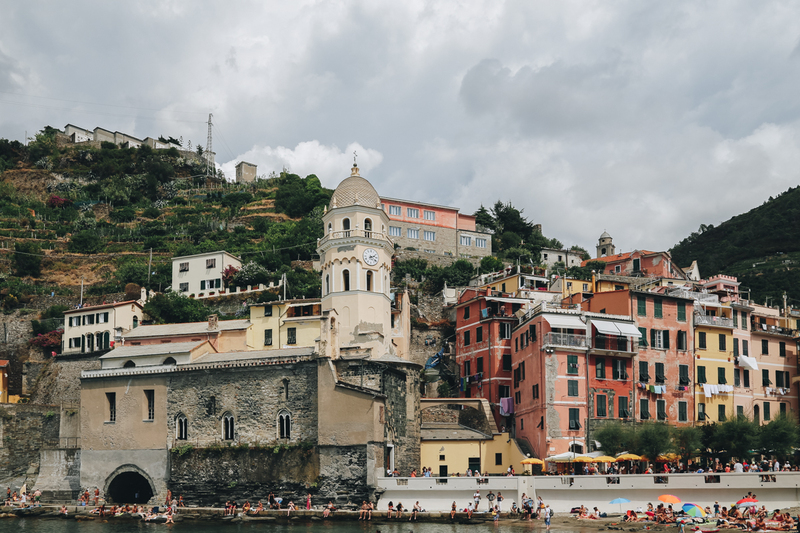 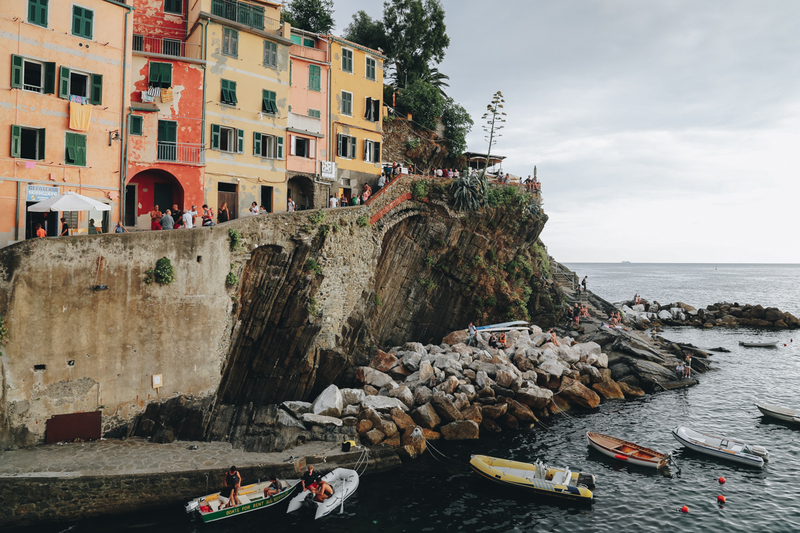 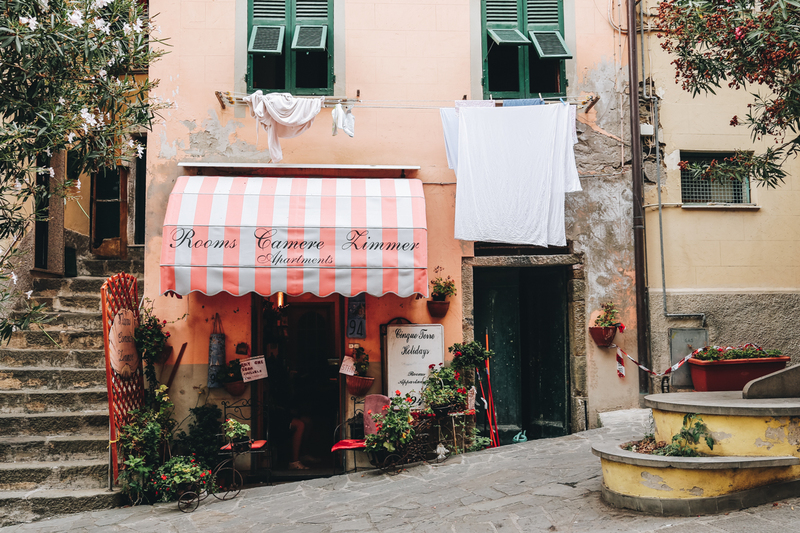 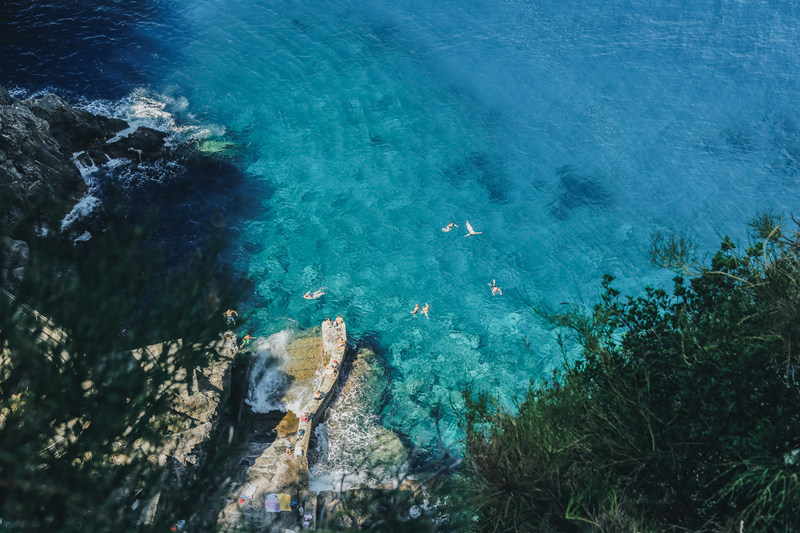 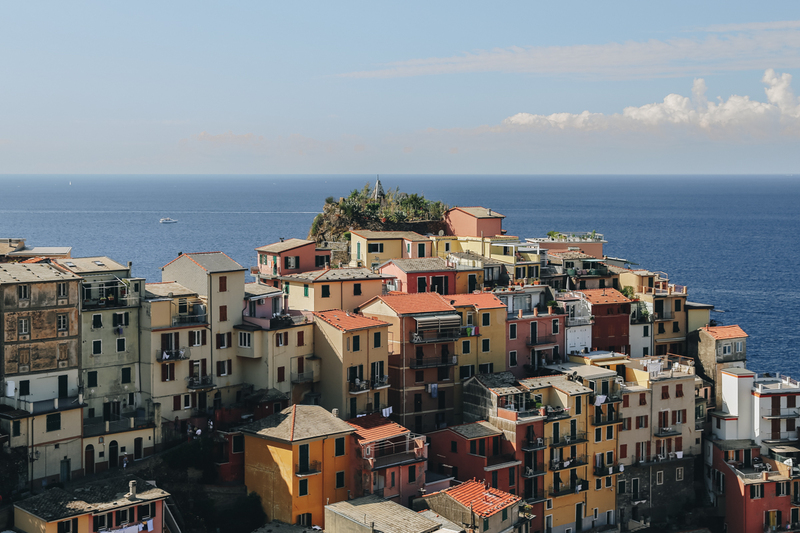 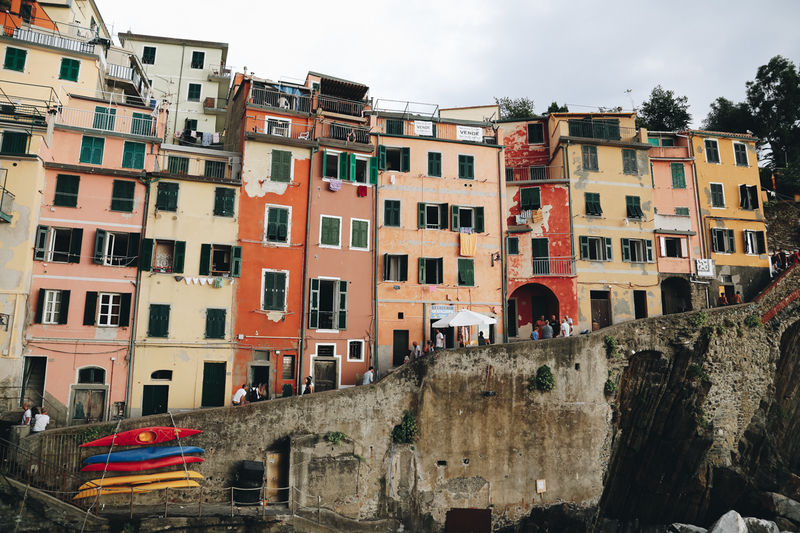 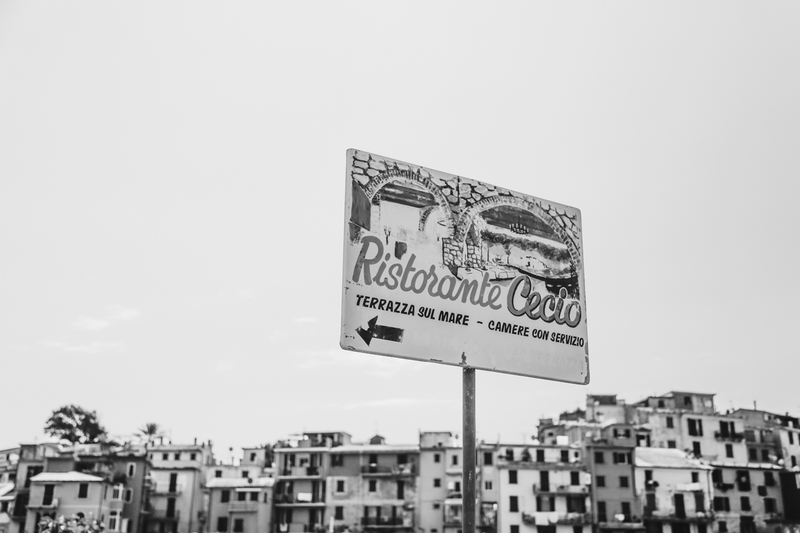 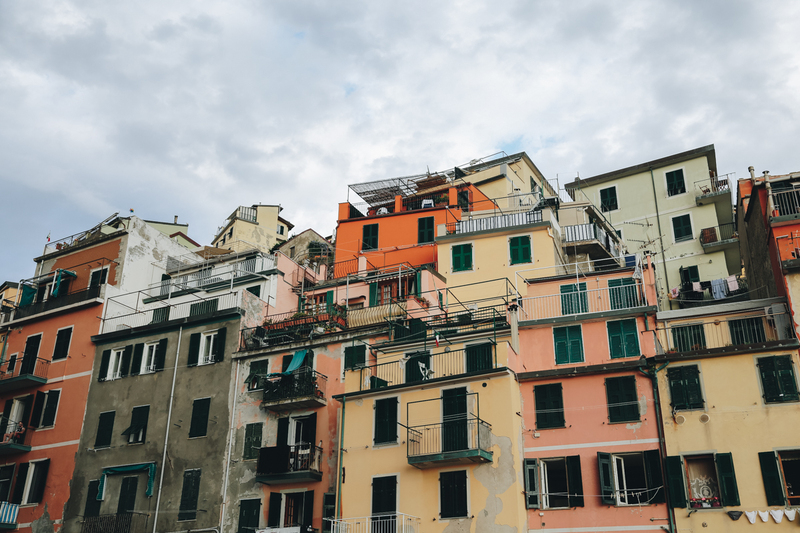 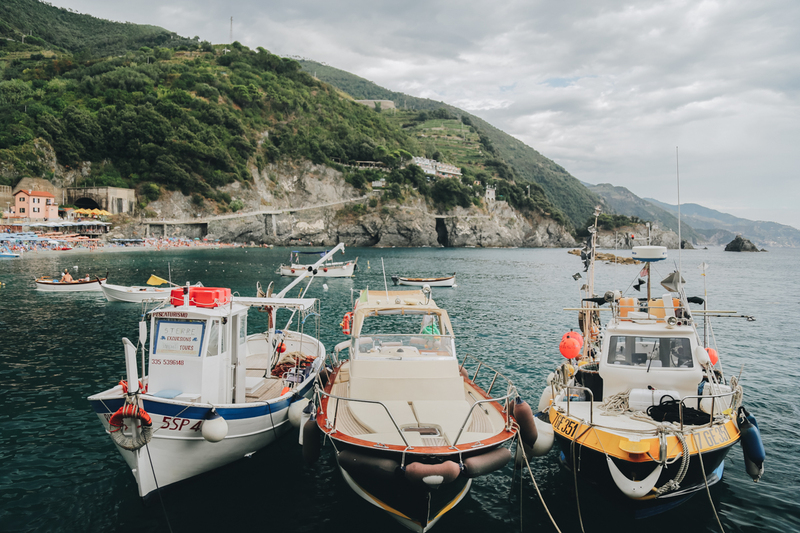 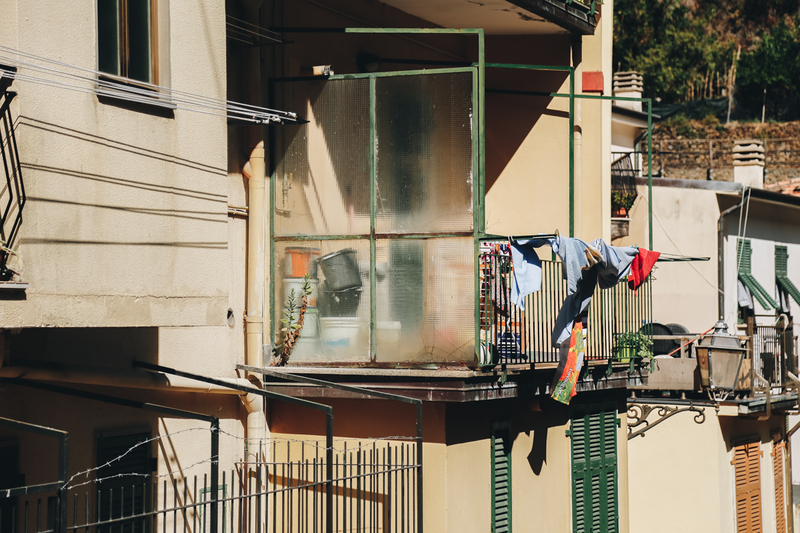 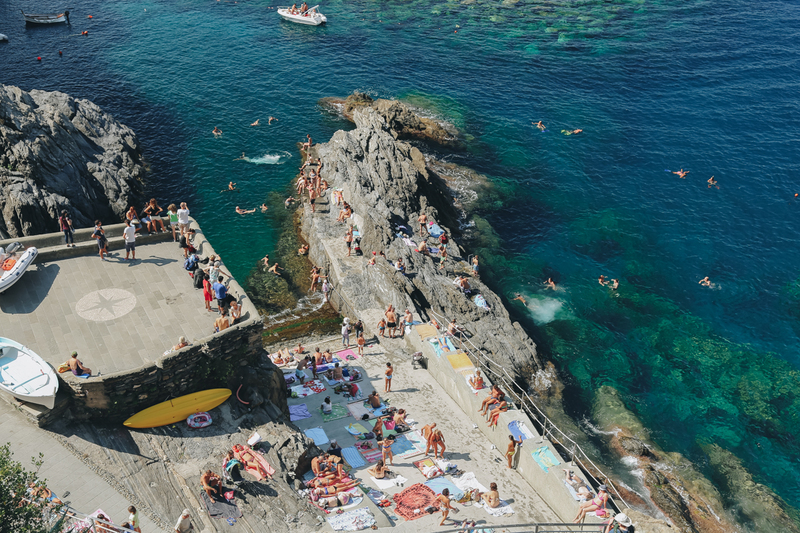 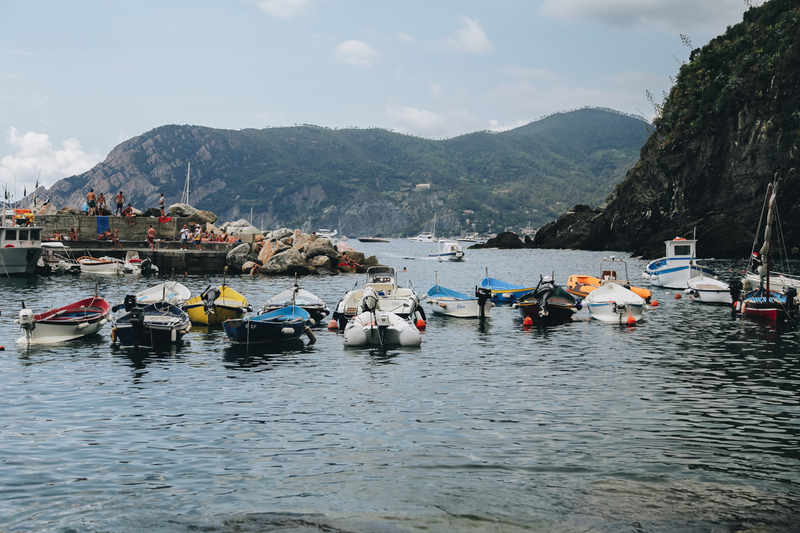 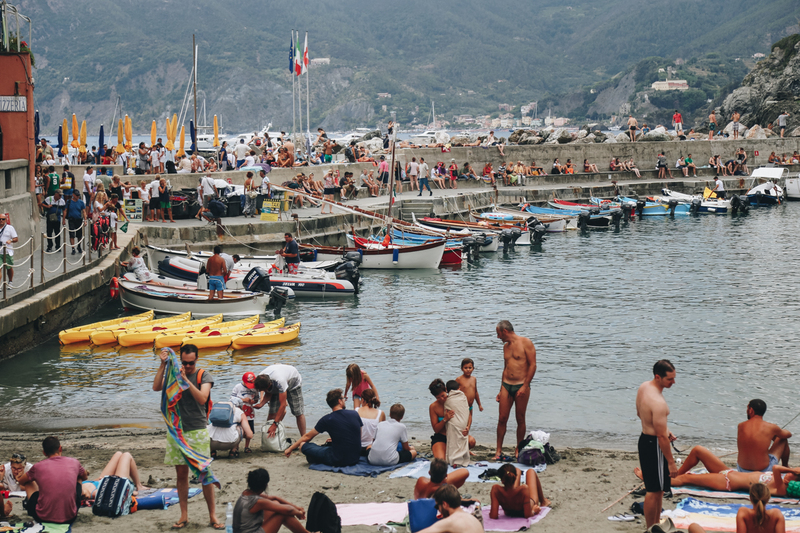 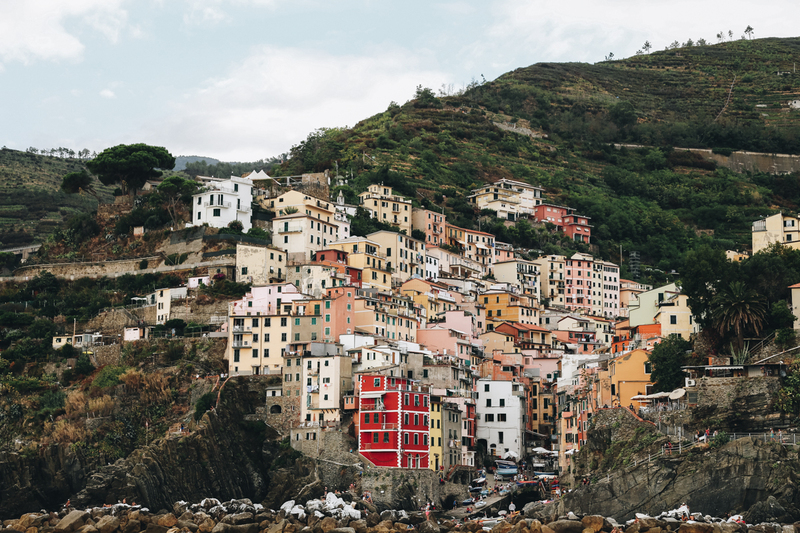 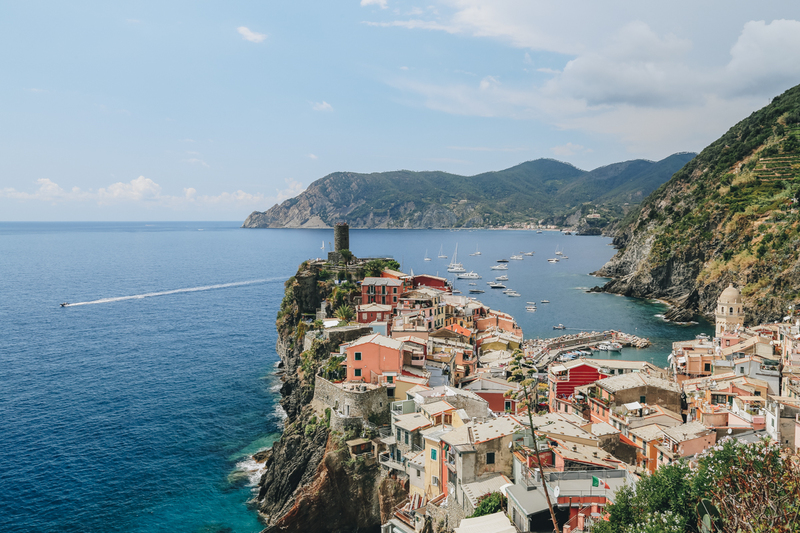 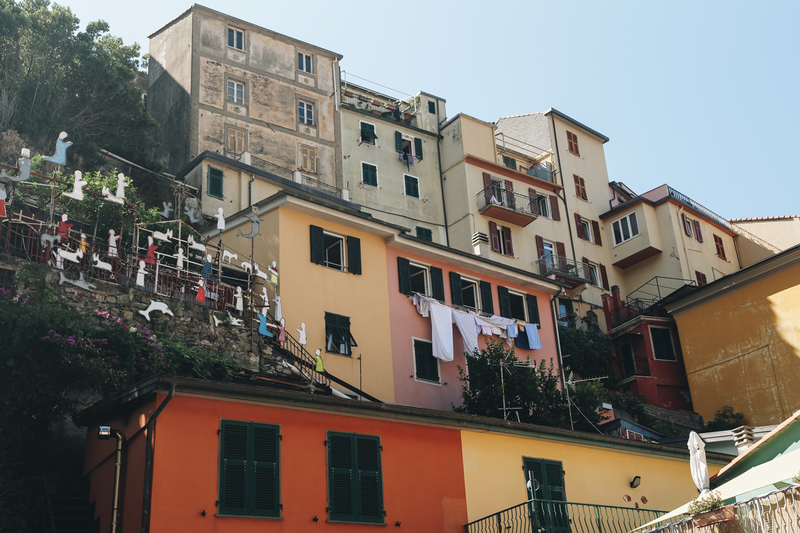 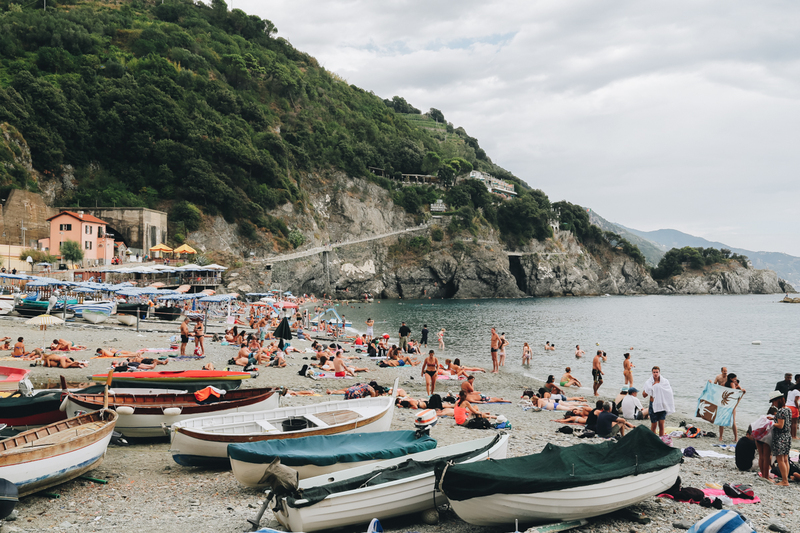 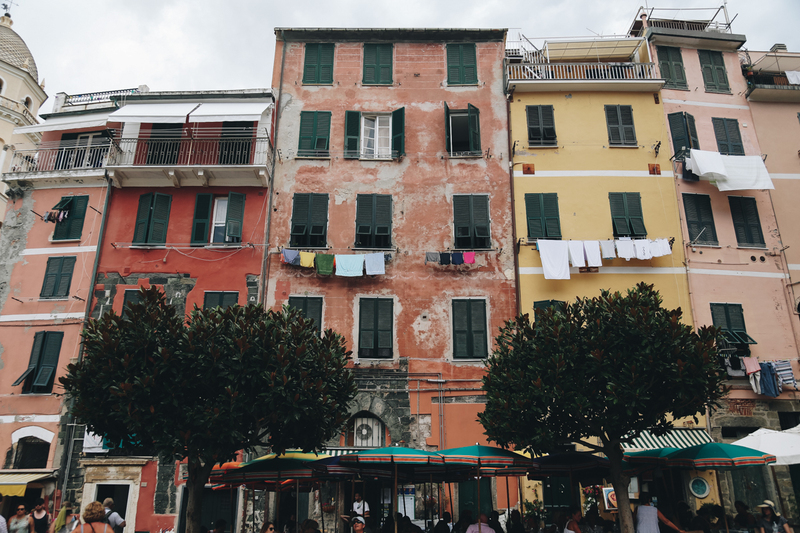 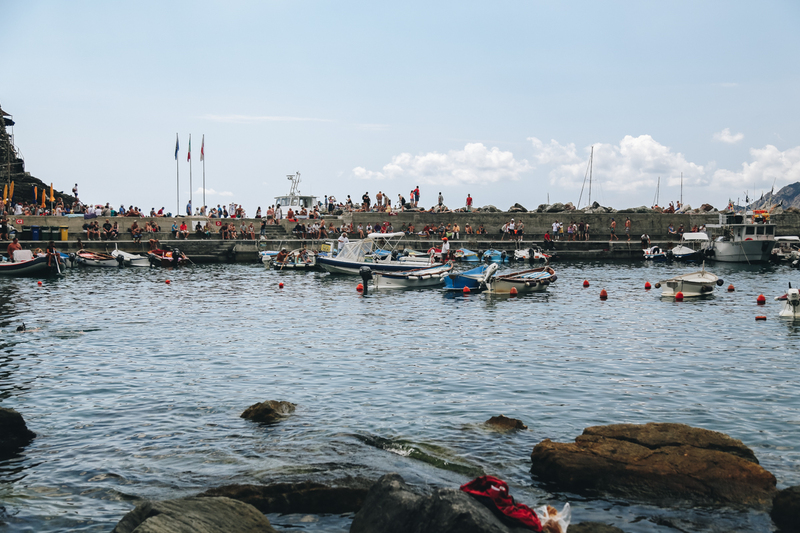 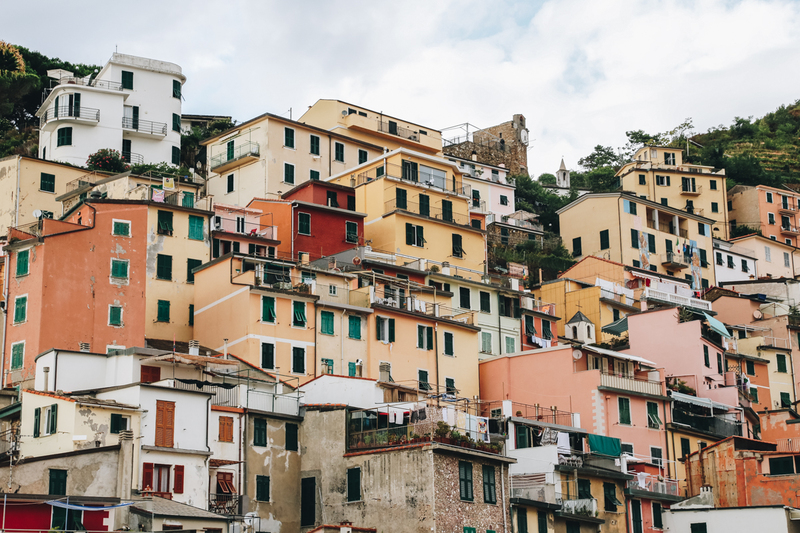 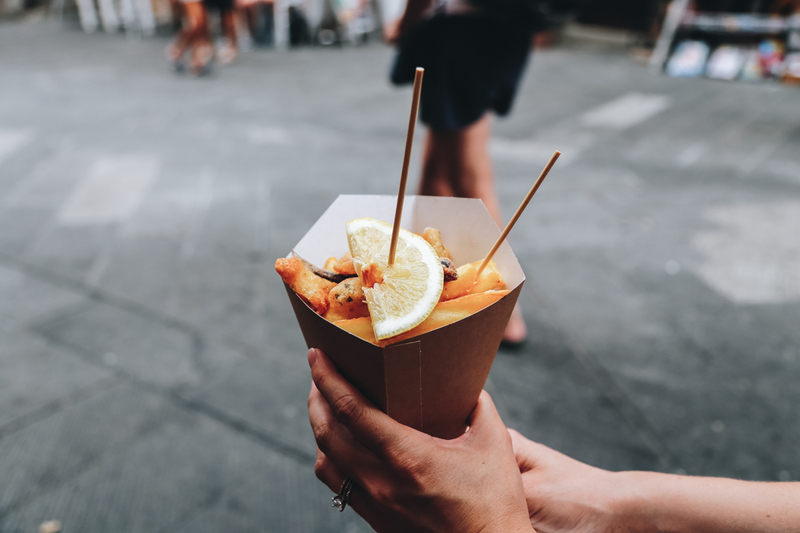 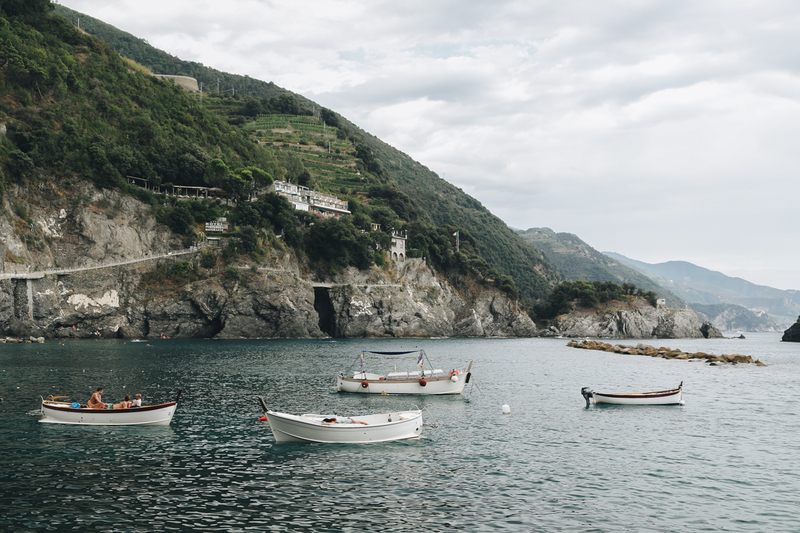 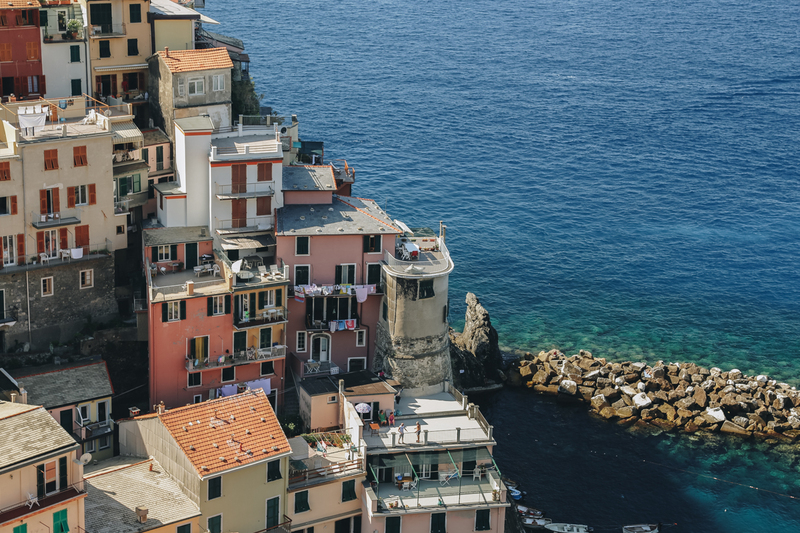 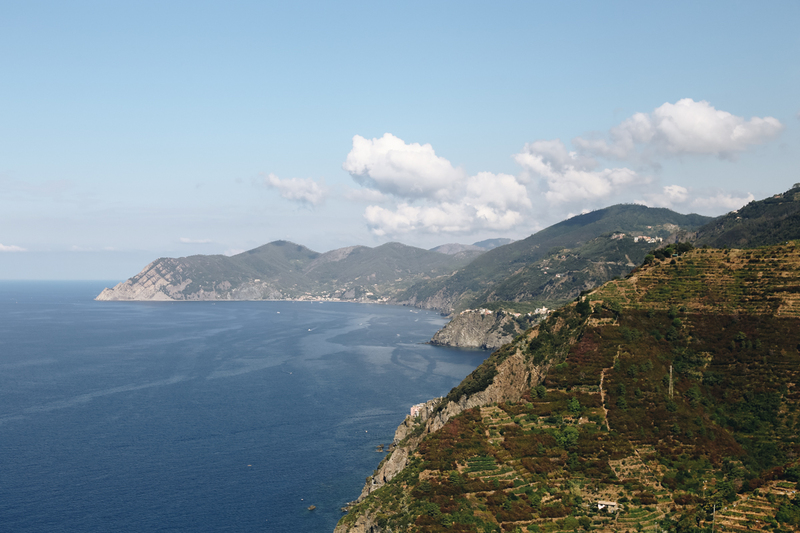 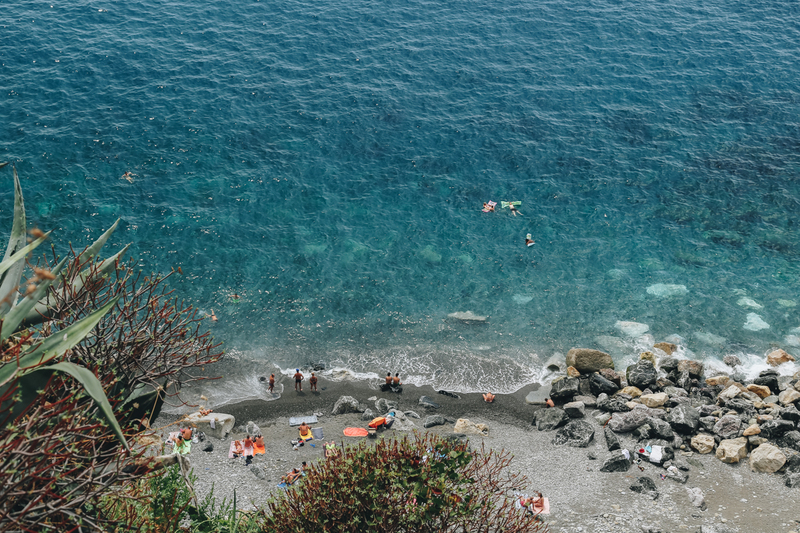 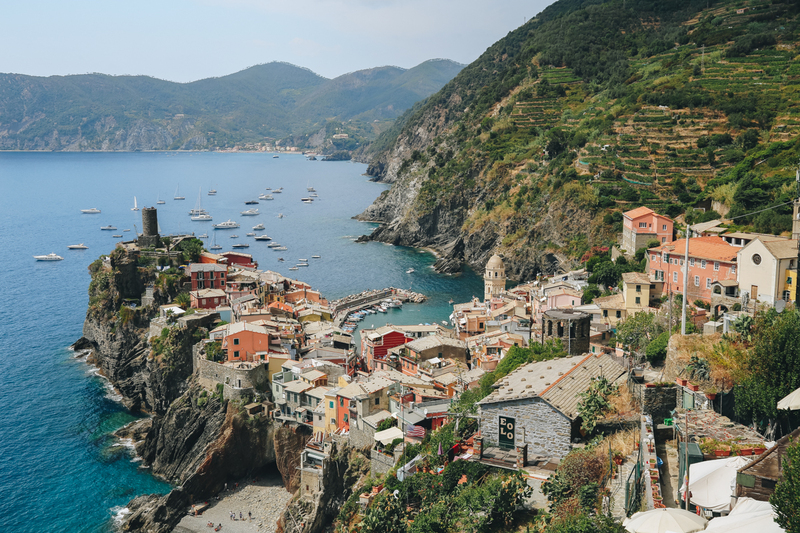 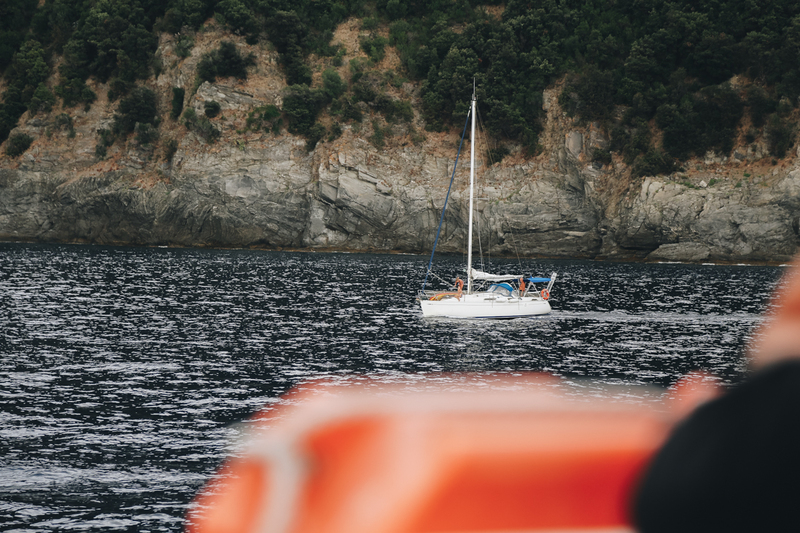 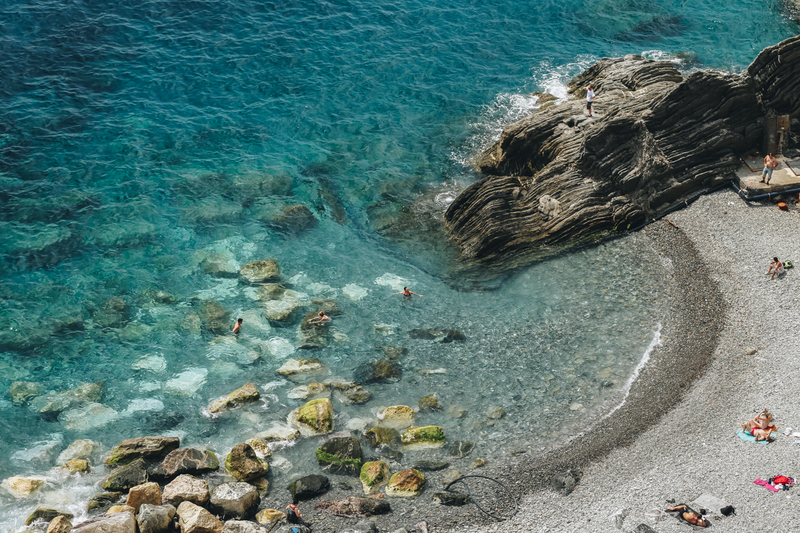 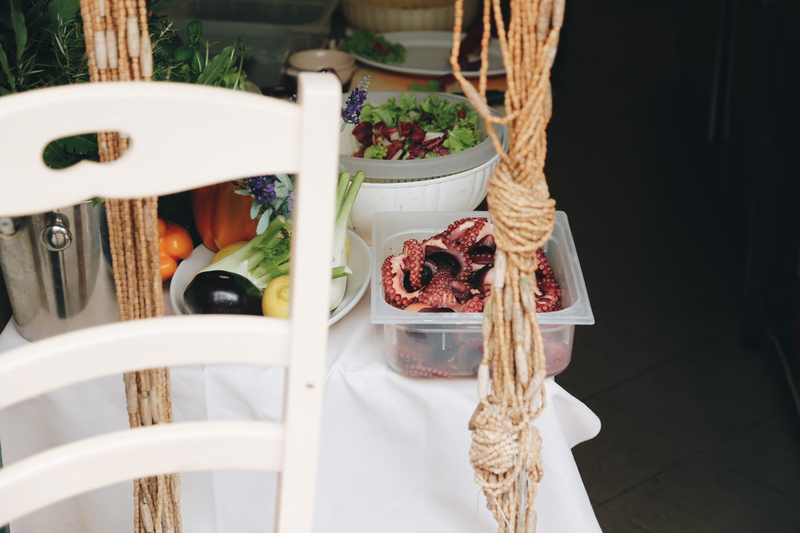 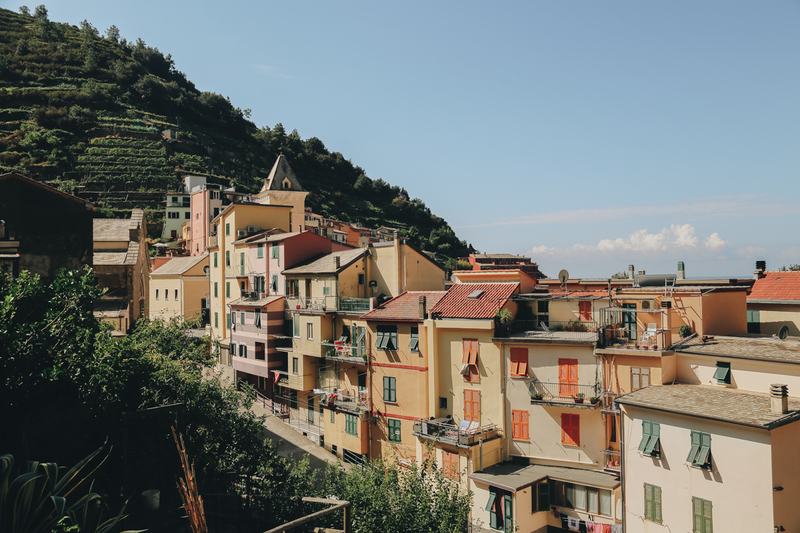 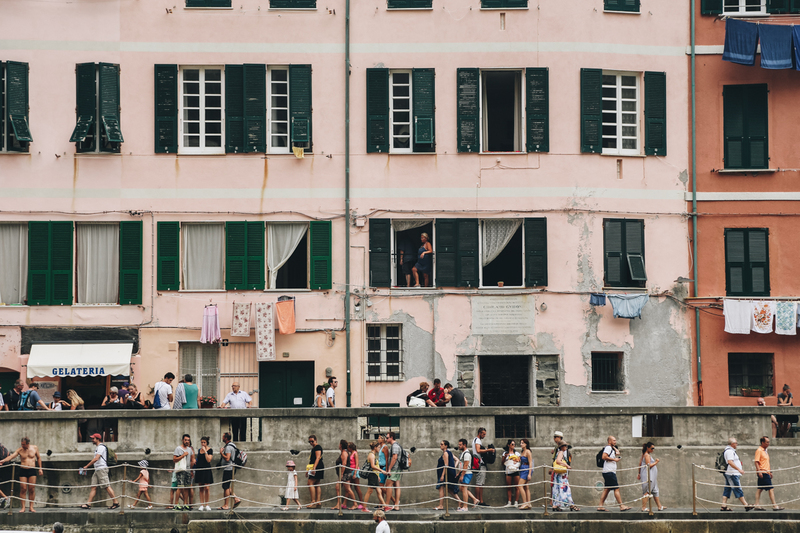 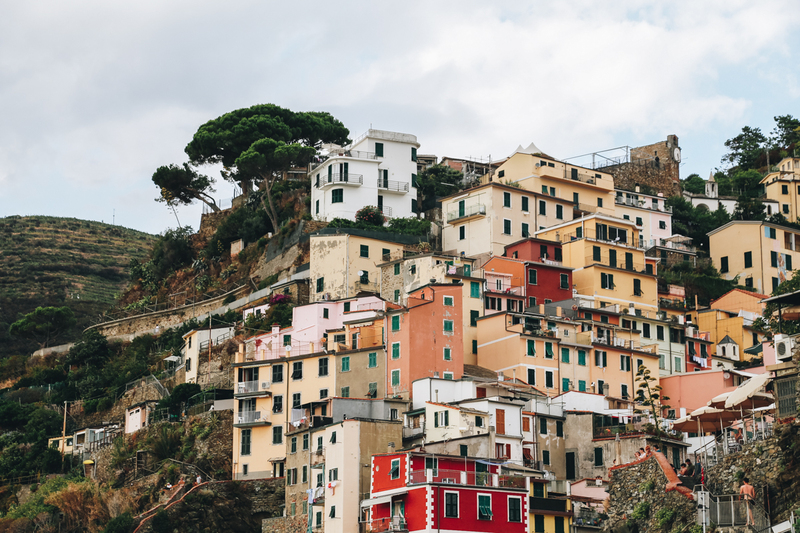 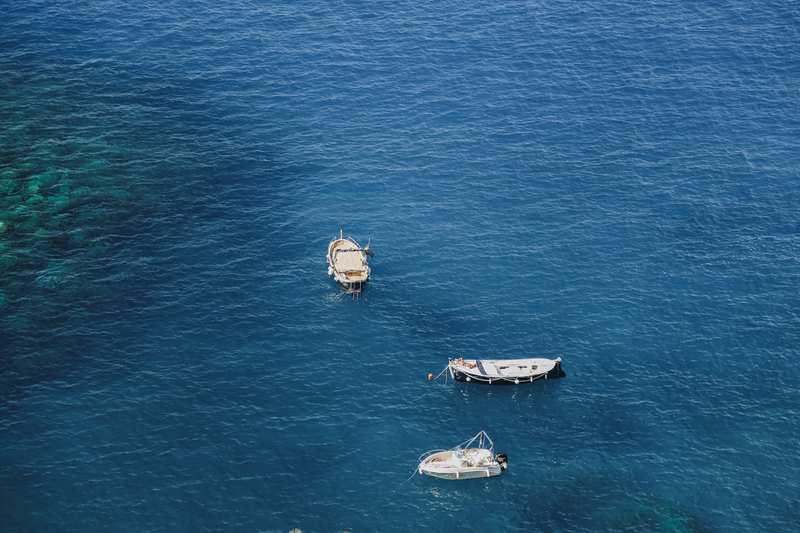 Pastels, sailboats, olive trees, sunbathers, clothes drying, boulders and pebbles, lazy cats, lots and lots of fresh and fried seafood—this is Cinque Terre. 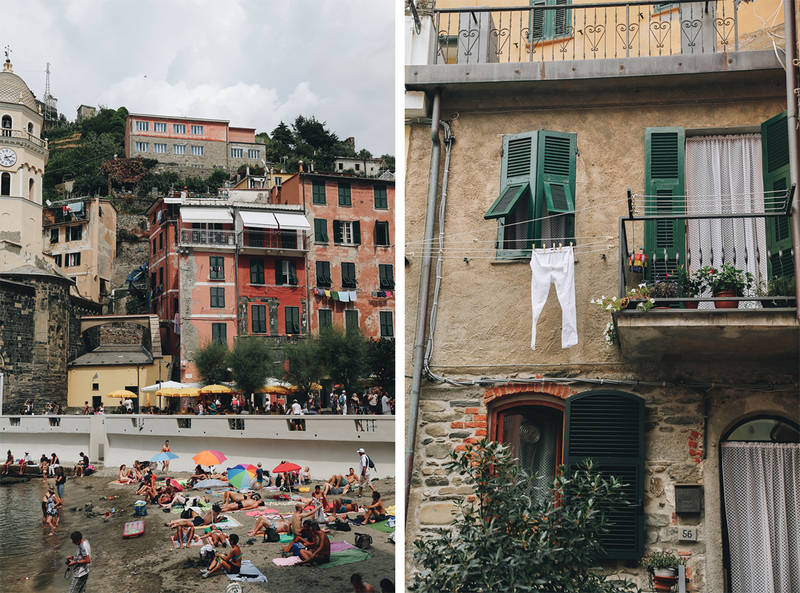 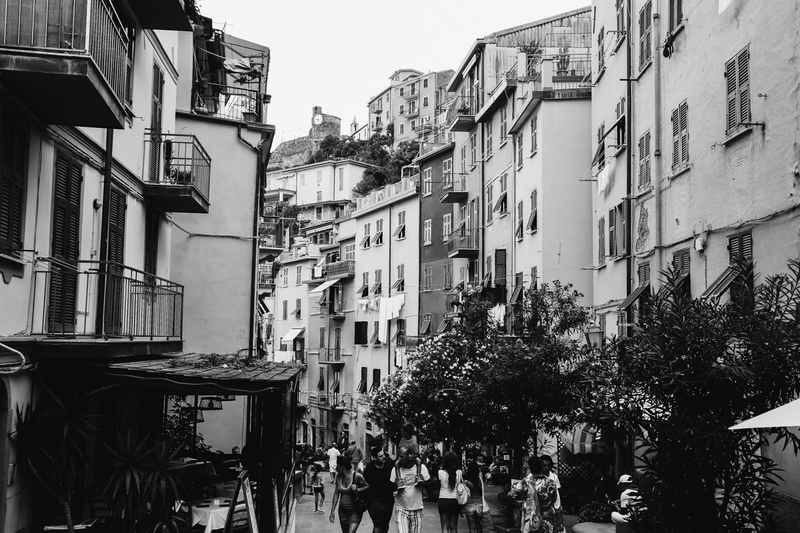 I loved visiting Cinque Terre during my trip in college and couldn’t wait to go back with Nick. 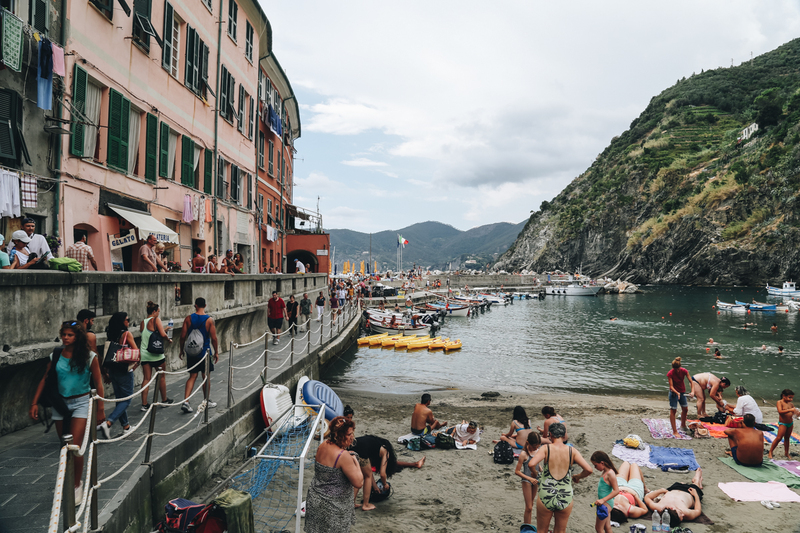 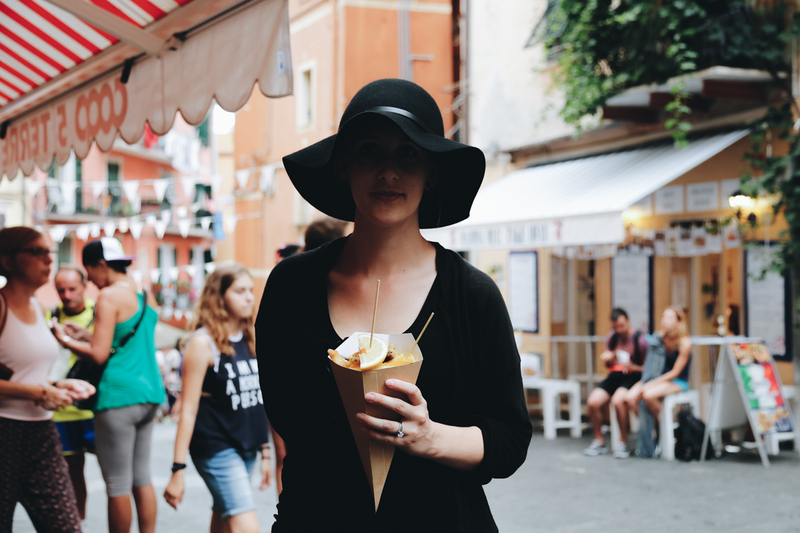 Since the park that’s home to the five villages is actually in the Liguria region, or “The Italian Riviera,” and not Tuscany, we had some coordinating to do since we were based in Florence for this portion of the trip. 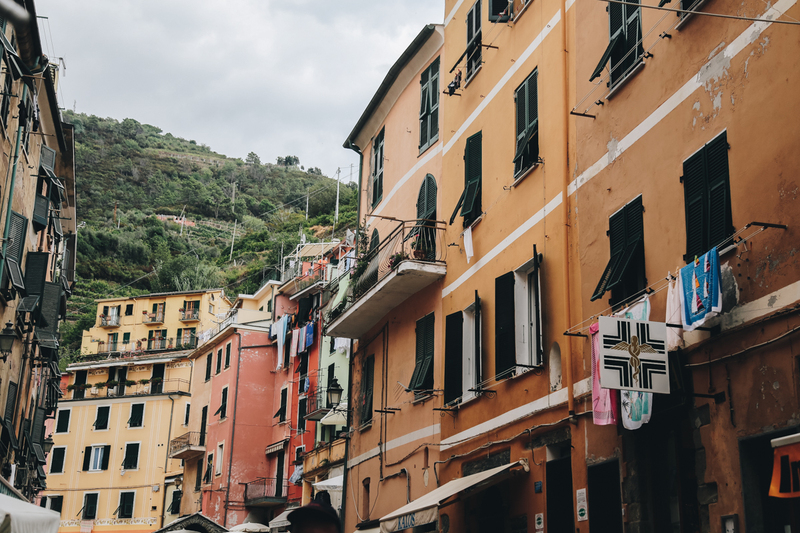 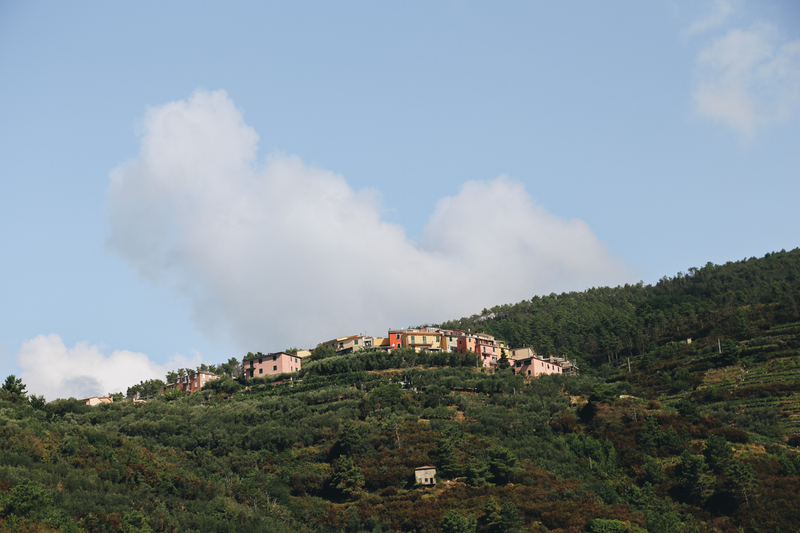 We debated transportation options and tried to pick just a smaller portion of the area to explore but finally settled on a hiking tour of all five terraced villages with bus transportation from Florence included. 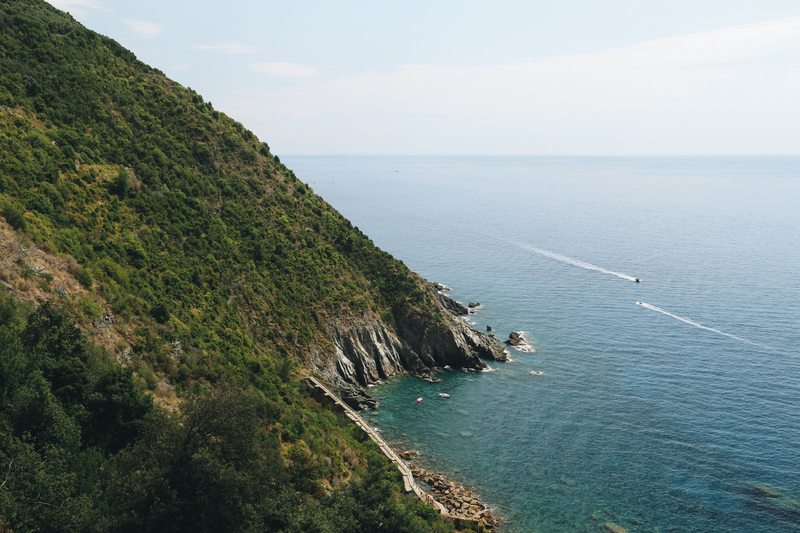 I had done a smaller portion of the hike on that college trip but this was the real deal: by the end, we were beat. 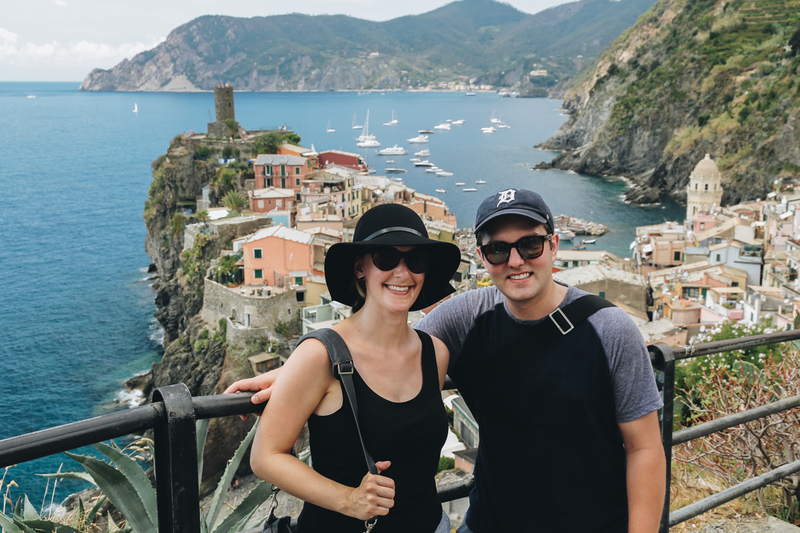 It worked out beautifully and I’m so glad we did the full hike, but to give you an idea; the entire hike is 11km, or just under 7 miles, and people estimate 5-6 hours to walk it straight through. 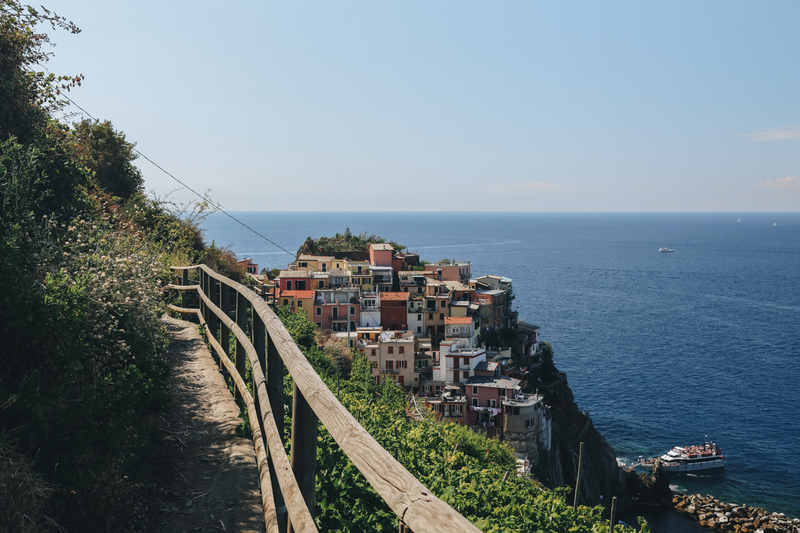 And while there is a total elevation difference of just about 500m, there are tons of steep sections, lots and lots of stairs, and very narrow pathways. 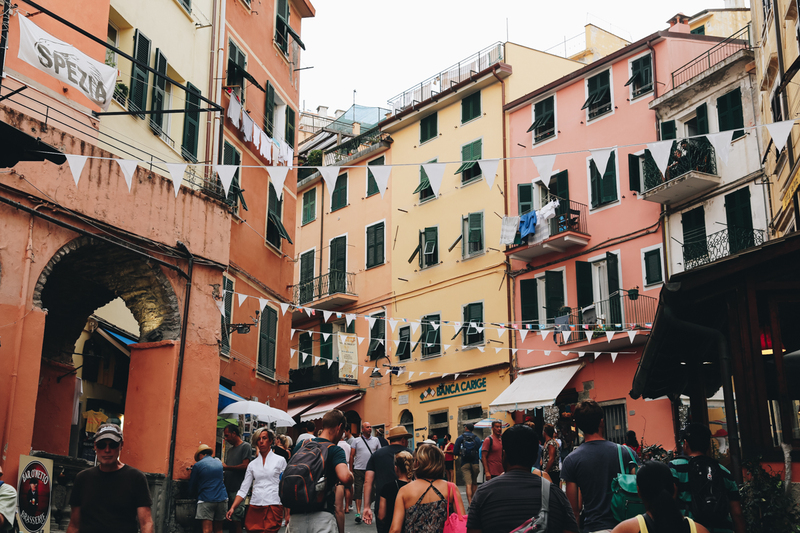 Okay, a quick, important PSA: when tours that require some physical activity state the endurance expectation, you should really, really make sure you understand what that entails, and be honest with yourself! 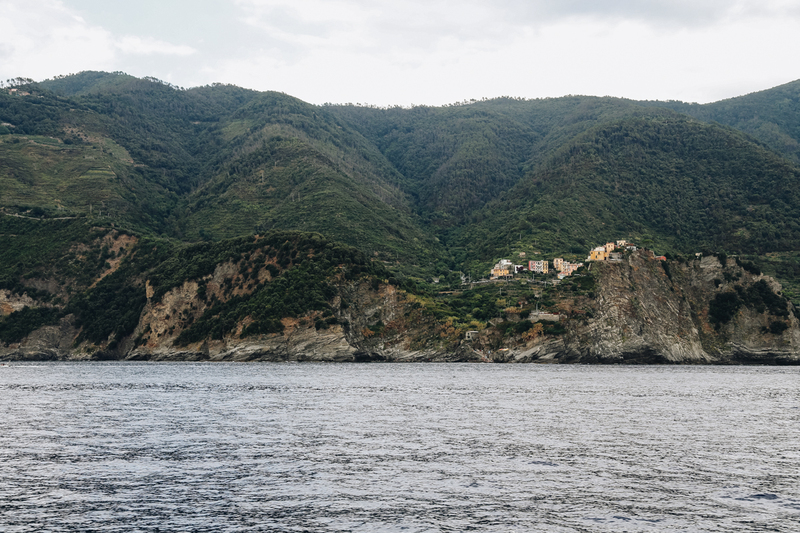 There were a couple people who weren’t able to make it very far on the hike after all, and once you’re there, you’re there. 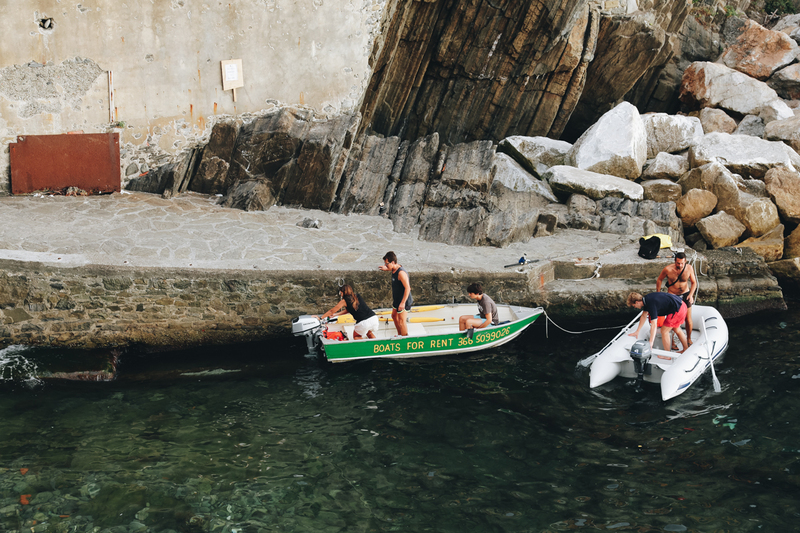 So rather than make the trip between all five stops, they had to turn around. 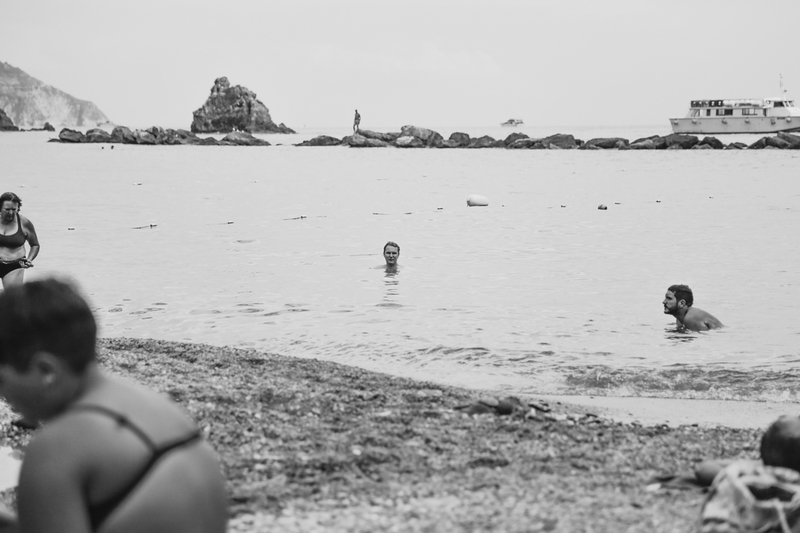 🙁 I felt for them, big time. 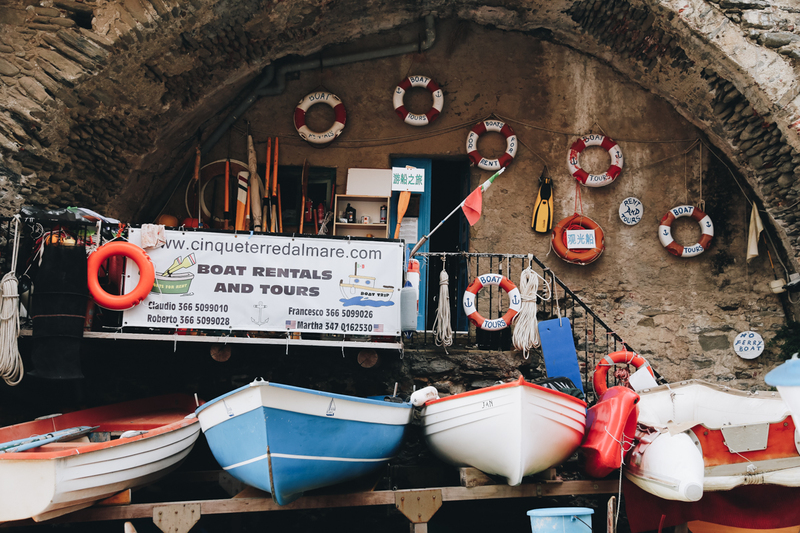 But there are so many other, more leisurely ways to see these beautiful coastal Mediterranean gems! 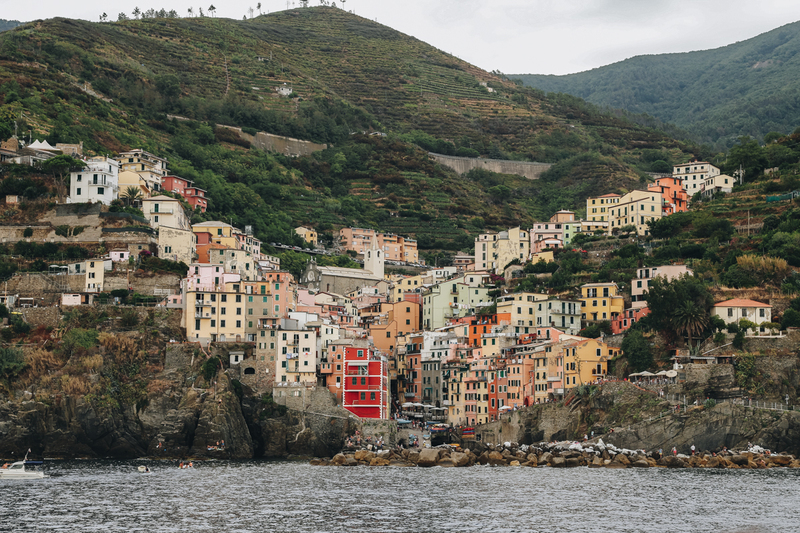 Our hike started south of Riomaggiore and included stops in each tiny Italian village that makes up what’s known as “Cinque Terre.” Stop 2 was Manarola and in village number 3, Corniglia, we stopped for lunch off the beaten path on a high perch at a place called CECIO Ristorante Camere for sprawling views of the Mediterranean and great Ligurian food. 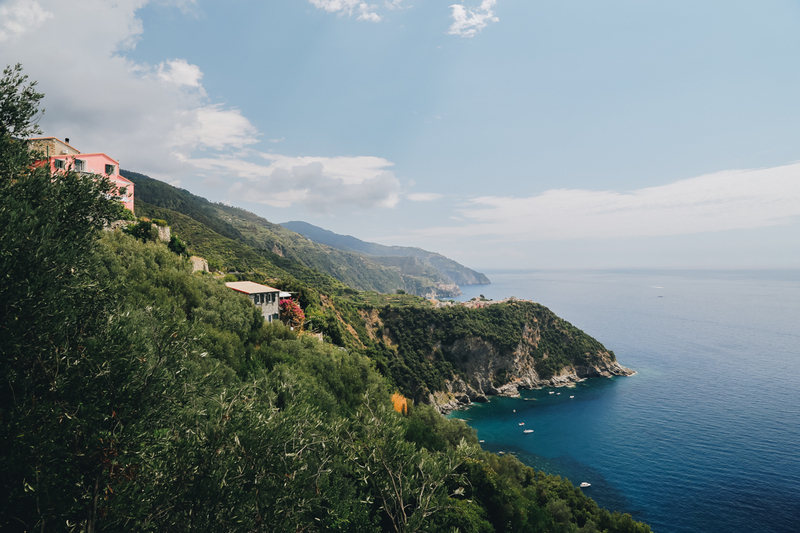 (Also, on the flip side of all this yumminess and beauty, I very distinctly remember chugging water on this hike like crazy and using the restroom probably 3 times during lunch because I was terrified by how long it would be before I saw another bathroom!). 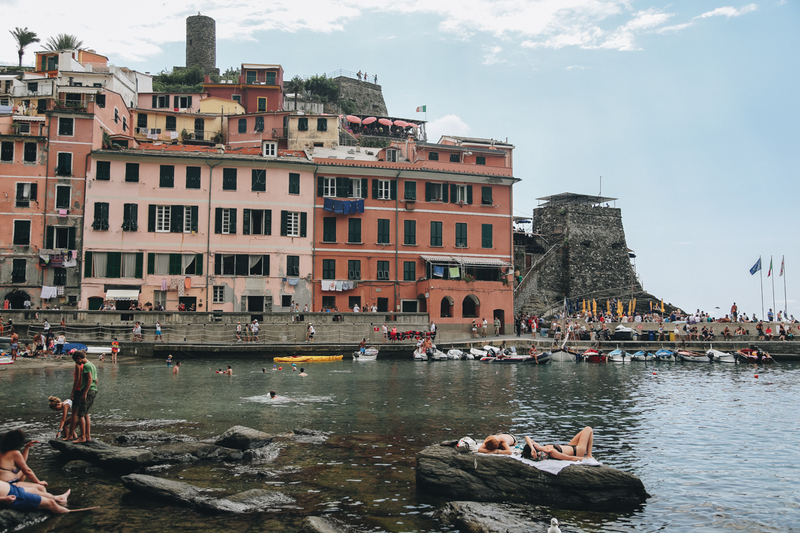 I love all these tiny villages but I think my favorite is Vernazza. 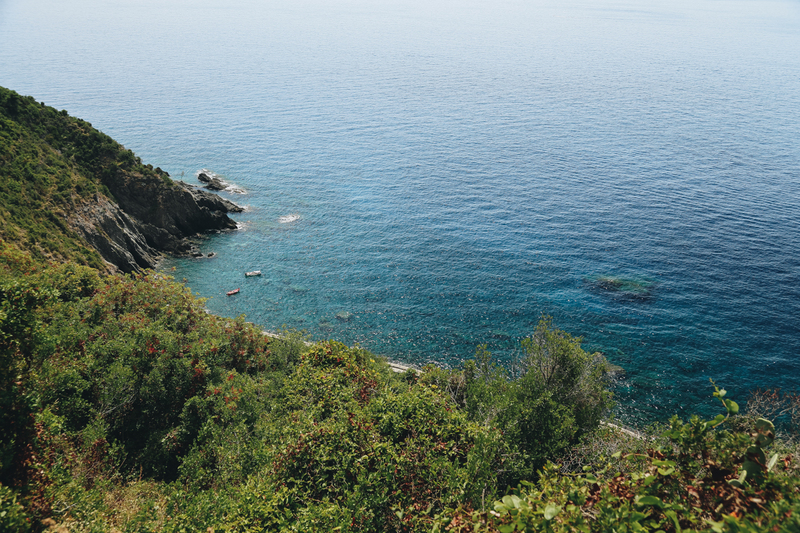 In college, this is where we stopped and jumped into the freezing cold, salty Mediterranean. 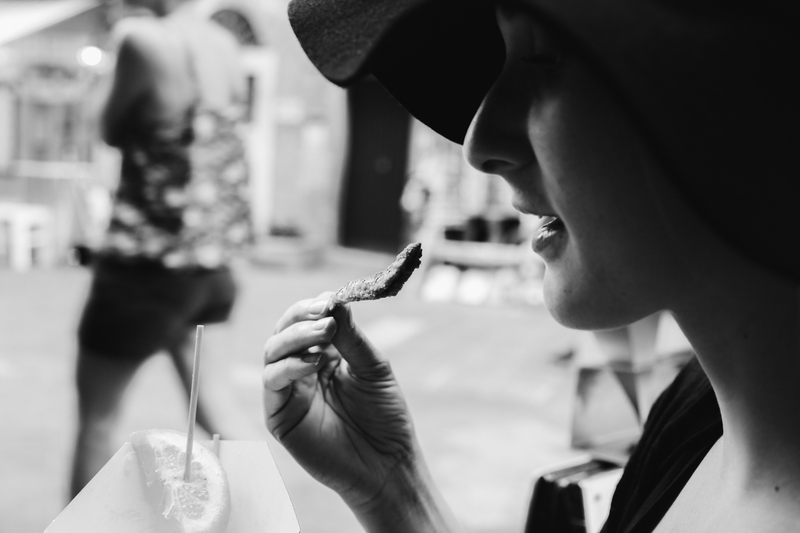 And this time with Nick, we ate the most perfect sardines and chips; when I think about it now I can almost taste them. 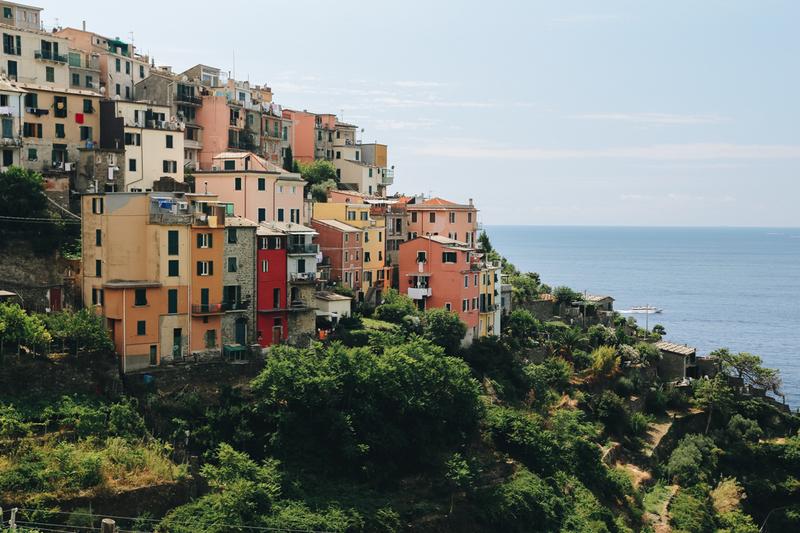 This tucked-back, little village would be my top choice for a peaceful weekend away.